Lt. Gen. Christopher G. Cavoli assumed command of U.S. Army Europe Jan. 18, 2018. Commissioned into the Infantry in 1987, LTG Cavoli has served in a wide variety of positions throughout the United States, Europe and Asia. He’s commanded the 1st Battalion, 32nd Infantry Regiment; 3rd Infantry Brigade Combat Team, 1st Armored Division; 7th Army Training Command; and 25th Infantry Division. He also served as the Deputy Commander of Regional Command West in Herat, Afghanistan, and as the Deputy Commanding General for Operations at 82nd Airborne Division. 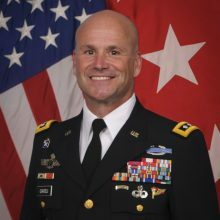 LTG Cavoli’s staff experience includes service as the Director for Russia on the Joint Staff; Deputy Executive Assistant for the Chairman of the Joint Chiefs of Staff; and Director of the Chief of Staff of the Army’s Coordination Group. He’s held fellowships at National Defense University, the George C. Marshall Center for European Security Studies and the Army Chief of Staff’s Strategic Studies Group. LTG Cavoli is a Foreign Area Officer with a concentration on Eurasia, and speaks Italian, Russian and French. He holds degrees from Princeton University and Yale University. His awards include the Combat Infantryman’s Badge, the Ranger Tab and Master Parachutist’s wings.